Top Three Things that I Taught My Daughters That’ll Probably Get Us a Seat On Dr. Phil’s Couch One Day. | Daddy's Doing Hair?!?!? Top Three Things that I Taught My Daughters That’ll Probably Get Us a Seat On Dr. Phil’s Couch One Day. There are a few things that I taught my girls when they were younger that I’m pretty sure will land us a spot on Dr. Phil or Oprah, or worst case scenario, Jerry Springer. So, in an attempt to gain some future audience leniency, or maybe perform a well timed preemptive strike, I decided to come clean and share the top three. I am not proud of these acts (sniff…sniff)…and…and…and I hope to do whatever I can to atone for them…(Sniffle..sniff…sniff…eye wipe). Here they are in no particular order (and with a bit of backstory). 1) Lightning bugs– I convinced them that they could “call” lightning bugs by running around yelling “ Biddi….biddi….biddi” at the top of their lungs. 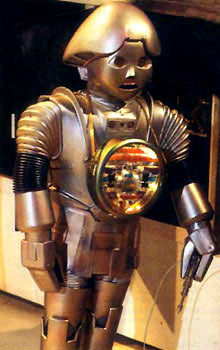 For the uninitiated, “biddi…biddi…biddi…” was the sound that Twiki (the lil robot) used to make on the old Buck Rogers T.V. show. I know it was wrong, I really do…but it was sooooo funny. I swear, I WANTED to stop…but I just couldn’t help myself. Besides, one day, I’ll tell them that they were quoting the lil’ guy below, we’ll all just have a good laugh and all will be well with the world………Right? 2) Cotton candy – I told them that cotton candy came from the dryer filter. They said that it didn’t make sense…and I told them to look at the label on their clothes. It went something like this. “What does it say?”, I’d ask. “Cotton” they’d answer…. (You could SEE the wheels starting to turn). Feel free to go ahead and call Dr. Phil………………I think I may need help. The cotton candy one?? Oooooh! Clever but wrong, wrong, all DAY wrong! 🙂 Gotta luv the creativity tho’. I think I should call Social Services instead of Dr. Phil. Too funny! I love it !!!! They funny part is Darrick does the same thing to London. Prassedes the corruption is family deep, I see it has gotten the younger generation as well. -___________- the cotton candy one still has me upset dad………………..